In a contentious election year, certain issues such as healthcare come up as if the nation hasn’t faced them before. But as George Santayana would likely attest, knowledge of our past is necessary. 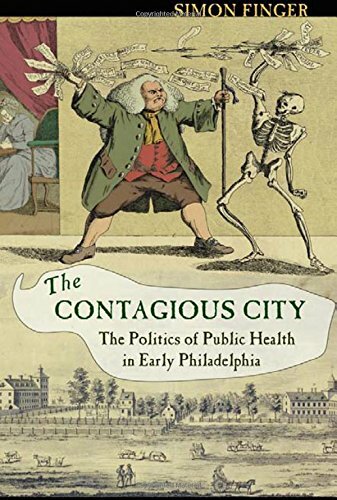 Dr. Simon Finger’s book The Contagious City: The Politics of Public Health in Early Philadelphia shows us that public health issues are nothing new to our nation—they extend back to colonial times. Dr. Finger constructs a solid and academic explanation of how the building of Philadelphia, epidemic disease, and politics played upon each other. The leaders of the time, William Penn, Benjamin Franklin, Benjamin Rush, Meriwether Lewis (of Lewis and Clark fame), and others “recognized that disease and debility were shared problems . . . But creating the conditions of health required politics as well as ideas. And those politics emerged in the train of official policies, popular practices, and partisan disputes rooted in the premise that public health was a shared goal and a collective obligation. Illness ceased to be a private matter. And by making wellness public, public health helped make Philadelphians, Pennsylvanians, Britons, and Americans.” The knowledge the leaders gained from developing Philadelphia lead to how they built the southern (i.e., New Orleans) and western urban areas of our continent. Readers with an interest in public policy and/or public health will find quotes from old documents and some academic terminology, but the reader will enjoy politics and science at the forefront of urban planning. Although set mainly in the 17th and 18th century, the lessons contained within the book are strangely timely. The founding of Philadelphia, alongside the American Revolutionary War was a political battle of climatist versus contagionist, of deforestation, and of immigration and cultural shifts. It was a battle of landlords and overcrowding, of business and hygiene. It was a battle of development of public hospitals, a health board, and how to pay for it. It was a battle of perceptions. With local and federal quarantine laws, it became a battle of States’ rights vs. the Federal government’s. Climatists viewed forests and wet ands as areas of sickness, so they engineered, cleared forests and dried uplands to make land “healthier.” The lumber became a resource for building. As immigrants were potential carriers of disease, but needed for the growth of the city and economy, a lazaretto or pesthouse was needed, to screen and quarantine immigrants. Philadelphians also built a hospital to care for the city’s sick. Immigration led to disdain and misunderstanding of people of color and their cultural ways. Control of all the forces of disease and a need for laborers to build and run the city ultimately led to the battle of public education and financing of health. Dr. Finger summarizes it by saying “Within the first years of the hospital’s existence, the managers abandoned the assumption that injury and illness were the only obstacles presenting their patients from participating in the labor force. Through a series of programs, they attempted to inculcate desirable habits of diet, drink, and behavior. Such habits would hopefully prevent future visits, but they were also exactly the kinds of habits that could make more diligent workers. Indeed, by 1766 the managers proposed to the assembly the addition of a workhouse in which the convalescent poor could engage in light labor, for which the hospital would be remunerated by the province—an arrangement they claimed would both solve the hospital’s continuing financial problems and train the inmates back up to laboring condition . . .” London wasn’t the only city bearing Dickensian-like ideas. Specifically, the 1793 yellow fever outbreak led to the development of the Board of Health for responding to and to preventing future outbreaks. Philadelphians built a permanent health office on Staten Island that had increased powers of inspection and detention of ships and the people on board. Alongside these increased regulations, a battle of quarantine laws, of States’ rights vs. Federal government. In 1796, Congressman Samuel Smith’s bill granted the president discretion over quarantine policy throughout the nation. It “. . . reflected the challenge faced by individuals and communities both—how to establish mutually beneficial public health measures among multiple autonomous actors with sometimes competing interests.” Policymakers in agreement with the bill wished to protect national interests in revenue and trade under the constitutional commerce clause, but the opponents of the bill opposed Federal quarantine—they wanted local control. When our nation’s history is broken down to the basic battles, Dr. Finger illustrates the importance of the development of public health to the founding of Philadelphia and Pennsylvania in general. The ripple effect of those policies over time on our nation made us what we are today: a nation divided over public health and politics. Arguments don’t change, really, but progress is made nonetheless.